Your comments will shape our Smart Growth Strategy so it's important that we hear from as much of the community as possible! Thank you for your input. Thank you for joining us for our Envision the Urban Rogue Valley forum! Thank you to everyone who came to learn about Smart Growth tools and to engage in a lively, informative discussion about how to implement these tools in the Rogue Valley. For those of you who missed it (or were present at the forum but would like to offer more feedback) but would like to be part of the discussion, please take our online Smart Growth Survey Click here to take survey. Your comments will shape our Smart Growth Strategy so it's important that we hear from as much of the community as possible! Thank you for your input. Participants give feedback on Smart Growth discussion at Envision the Urban Rogue Valley. What is Envision the Rogue Valley? 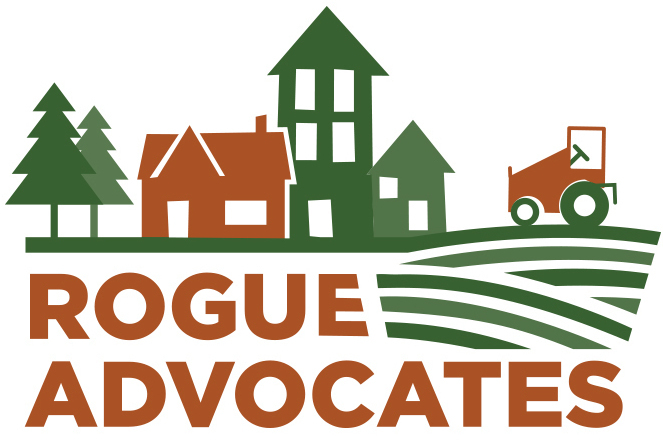 Thanks to a generous grant from Meyer Memorial Trust, Rogue Advocates has launched "Envision the Rogue Valley" to help make this vision a reality here in the Rogue Valley. Throughout 2011-2012, we will be working with community members, city and county planners, transportation agencies and other local decisionmakers to create and then implement this vision in the Rogue Valley through the use of "Smart Growth" tools. (Read more about "Smart Growth" here). *Envision Oregon was a process led by 1000 Friends of Oregon and other collaborating organizations. After two years of town-hall style meetings across Oregon, 1000 Friends published "A Blueprint for Oregon's Future," which outlines basic state-wide strategies for smarter land use planning in Oregon, including: 1) preserve farmland, 2) reducing our dependence on the car and 3) improving the livability of our communtiies. For more information about Envision the Rogue Valley, contact Sarah Vaile at sarah@rogueadvocates.org.